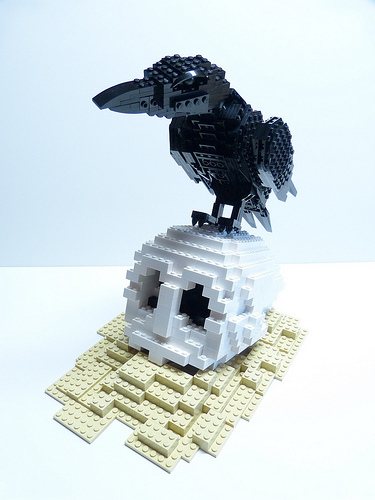 This stately raven is a lovely build and it compelled me to start reciting Edgar Allen Poe, so that is something else in its favor. I love the bird itself but showing it perched on a skull is even better. I’m naming the skull “Pallas”. Adam Dodge built this during a session he did on CTV Regina, promoting a show by SLUG. Wonderful build. Pallas is one of the names of the Greek goddess of Wisdom, Athena. Poe’s raven would be on a marble statue. Odin’s ravens, Huginn (Memory) and Muninn (Thought), often visited battlefields. Ultimately its up to Adam though.